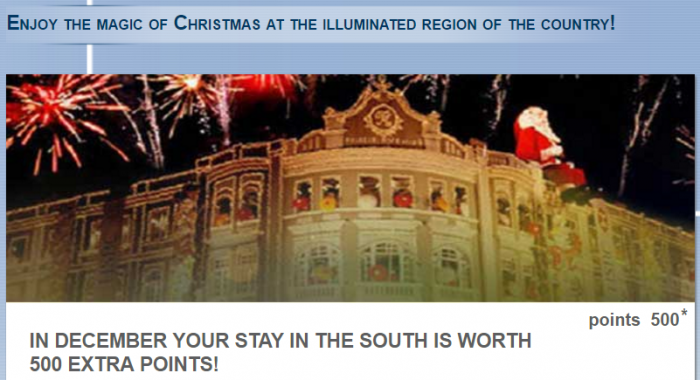 Le Club AccorHotels has launched new Christmas season promotion for stays in select cities and hotels in Brazil. Le Club AccorHotels members can earn 500 bonus points per stay consumed December 17 – 31, 2016, that are booked November 29 – December 22. Note that it is unclear what hotels and cities are participating to this offer. The list is revealed after successful registration (I was not eligible). Not sure if my account was not eligible for this offer or that Le Club AccorHotels hasn’t just enabled it yet. Some bonus points for those that travel in/to Brazil at the end of December. 1. The terms and conditions Le Club Accorhotels apply to the offer Enjoy the magic of Christmas at the illuminated region of the country! and to enjoy it must be associated with Le Club Accorhotels. 2. This offer allows members Le Club Accorhotels, regardless of their status, benefit from the accumulation of 500 points for a host in one of the hotels participating in the loyalty program Le Club Accorhotels. This promotion does not apply to partner hotels Le Club Accorhotels. The number of bonus points for this offer is calculated according to the points earned by associated with Classic status. 3. This offer is valid for hosting an associate of 17/12/2016 to 12/31/2016 in one of the participating hotels that has sidoreservada between 29/11/2016 and 12/22/2016 . 4. The accommodation must have a minimum of 1 night (s). 5. Any consecutive accommodation (check-out and check-in on the same day) at the same hotel will be considered as one stay.This unique lodging once will be valid for the offer Enjoy the magic of Christmas at the illuminated region of the country! . 6. For the purposes of this offer, a hosting is one (1) reservation made by an affiliate Le Club Accorhotels to one or more rooms at a participating hotel. For avoidance of doubt, a reservation made for more than a quarter will be considered as one (1) bed. 7. To take advantage of this offer, your reservation must be made in AccorHotels.com, websites and applications of the participating brands and Call Centers accorhotels. Any other reservation channels will not be eligible for this offer. 8. You must enter the number of your loyalty Le Club Accorhotels card when booking and present your card at the front desk at check-in hosting. 9. Bonus points Le Club Accorhotels are credited to the member’s account within 10 days after the end of your stay. 10. This offer is not compatible with other current promotional offers and benefits and does not apply to groups. If the hosting comply with the terms and conditions of various offers, only the points of the most generous offer (ie allowing more points) will be credited to your account. 11. Any paid hosting partially or interamente with Le Club Accorhotels points or with one or more vouchers will not be eligible to benefit from this offer and offers that require multiple accommodations for accumulating points. 12. This offer is subject to availability. The terms and conditions of sale for reserved public rates of each hotel are applied. 13. We request indicating the following reference: 48403 in all communications with the customer service accorhotels related to this offer. You must subscribe to the offer Enjoy the magic of Christmas at the illuminated region of the country! before making a reservation to participate in the offer. Next articleReader Question: Problems With The Hilton’s Best Price Guarantee?